Since the heroic day when Rangers Paul and Dan with the help of volunteers Jim, David and Mr T (Theo the dog) managed to rescue the boat from the willow tree and return it to dry land. 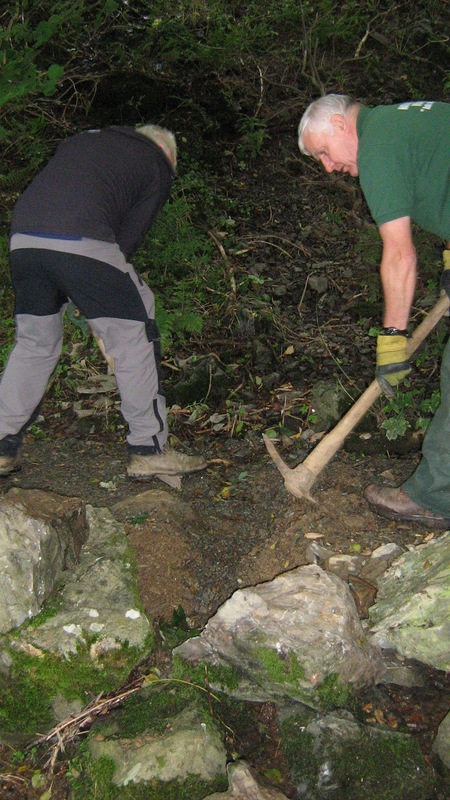 They have been working hard on repairing the path along the lakeshore at Loweswater. Whilst Phil was still enjoying the sunnier climates of Kos and David was busy sharpening his panel saw. 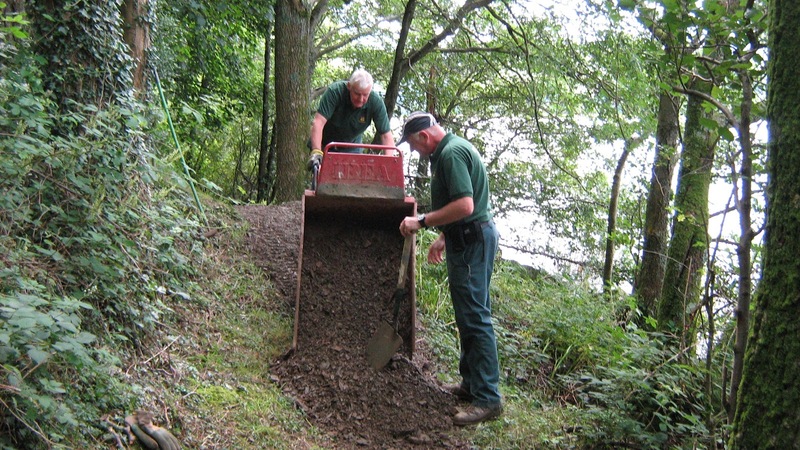 Paul, Dan and Jim started to make good progress with resurfacing the Loweswater lakeshore path using quarry waste which the forestry team had already kindly delivered. But, the following week all three of them were pleased to see the return of Phil and David, which made the task of shovelling the quarry waste into the power barrow much easier. 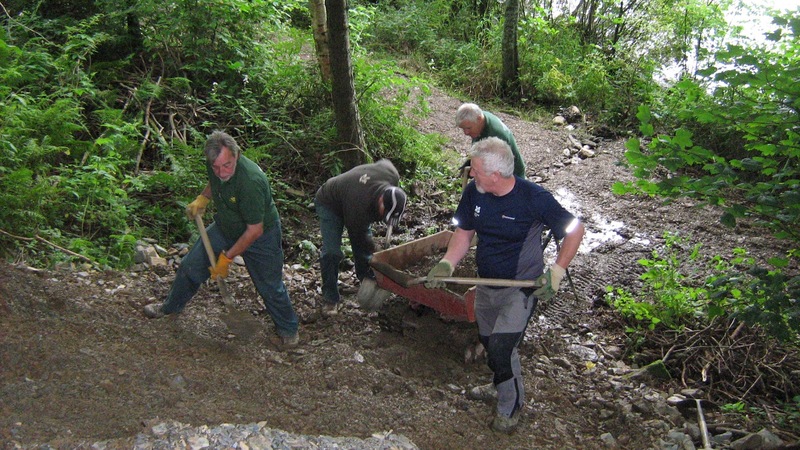 Once the power barrow was full to its capacity, the quarry waste was carefully transported along the path to the sections which needed resurfacing. Although a photo was found of Phil using the power barrow in the correct method, no photographic evidence could be located when the power barrow was accidentally tipped over! 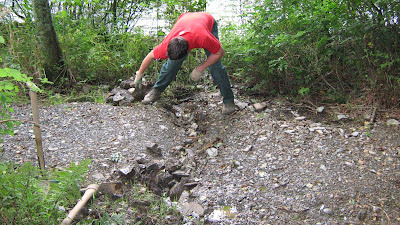 After the quarry waste was deposited along the path, the material was smoothed out and any larger stones were removed so the path could be compacted down. 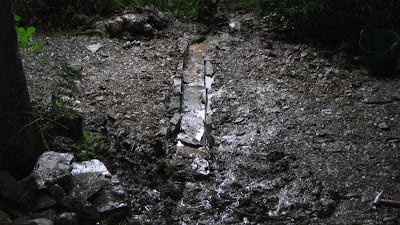 With the quarry waste running low the next task was to create two stone drains to allow water to flow off the path and into the lake. As Jim was away for this task, teams were selected with Paul being paired with Phil and David being partnered with Dan so both teams having one experienced drain maker with one less knowledgeable drain maker but still as enthusiastic. Both teams knew where their drains would be located so the first task was to clear a trench across the path. Luckily suitable stone had already been selected from various locations across the North Lakes property and brought to the site! This meant the side stones could quickly be put into place and wedged as well as any gaps packed with smaller stones so the side stones were firmly in place. 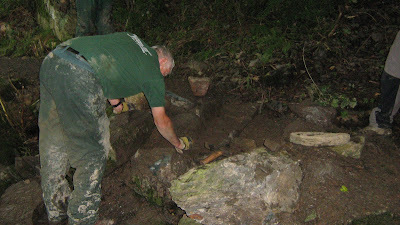 The next job was to line the bottom of the channel with stones that would fit tightly between the side stones. 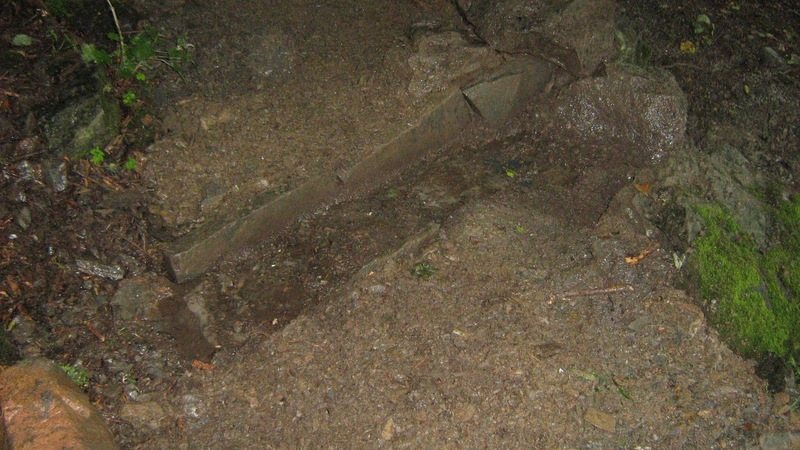 Then a finally a splash plate was located at the end of the drain to prevent further erosion. 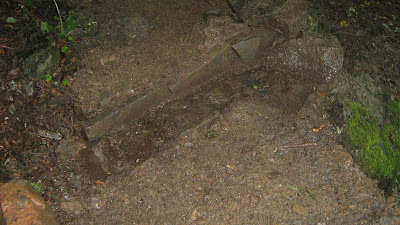 The following two photos so the completed stone drains. 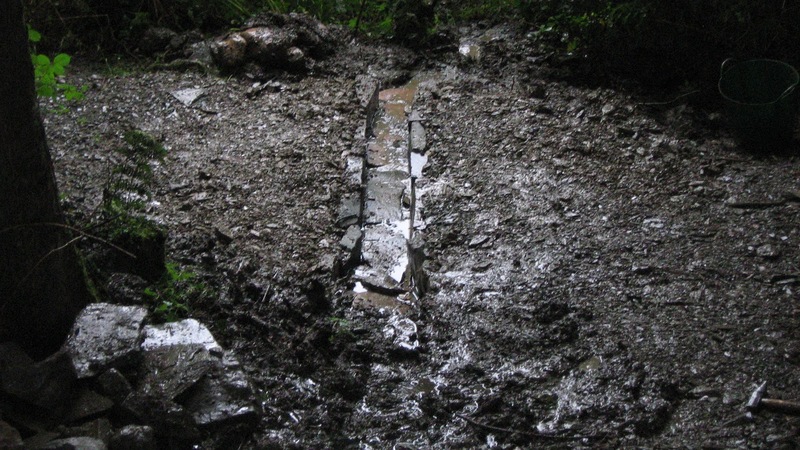 ﻿﻿Due to the good supply of stone available no conflicts occurred between the two teams and two credible drains were created! 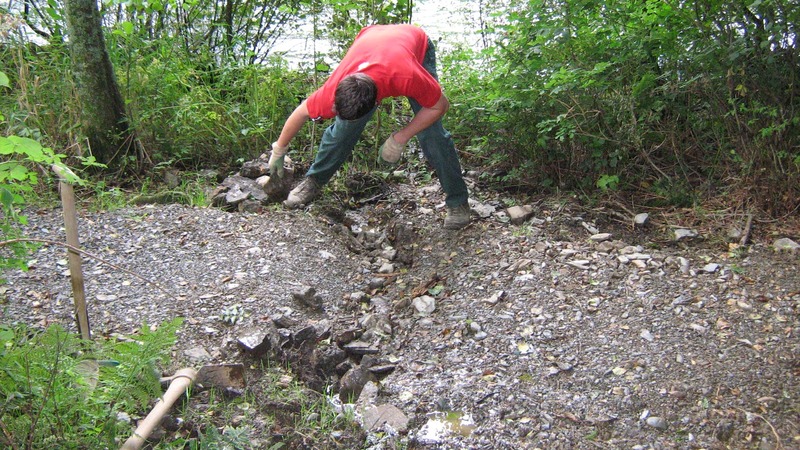 Further resurfacing will occur when quarry waste is transported to the site.